On Thursday, March 9, the United States Mint will hold a ceremony at the Liaison Capitol Hill Metropolitan Ballroom in Washington, D.C., to officially open sales of the 2017 Boys Town Centennial Commemorative Coin Program. Attending officials include Dave Motl, Acting Principal Deputy Director of the U.S. Mint, Rev. Steven E. Boes, Boys Town President and National Executive Director and Dr. Jerry Davis, Boys Town Vice President of National Advocacy and Public Policy. Coins in the program will be available for purchase at the venue following the event. Surcharges collected from all coin sales are authorized to be paid to Boys Town to carry out its cause of caring for and assisting children and families in underserved communities across America. Public Law 114-30 directs the Mint to strike and issue up to 50,000 $5 gold coins, 350,000 silver dollar coins and 300,000 half dollar clad coins to commemorate the 100th anniversary of Boys Town, which is Dec. 12, 2017. The obverse or heads side of the $5 gold coin features a thoughtful portrait of Father Flanagan designed by Artistic Infusion program designer Donna Weaver and sculpted by U.S. Mint sculptor-engraver Don Everhart. 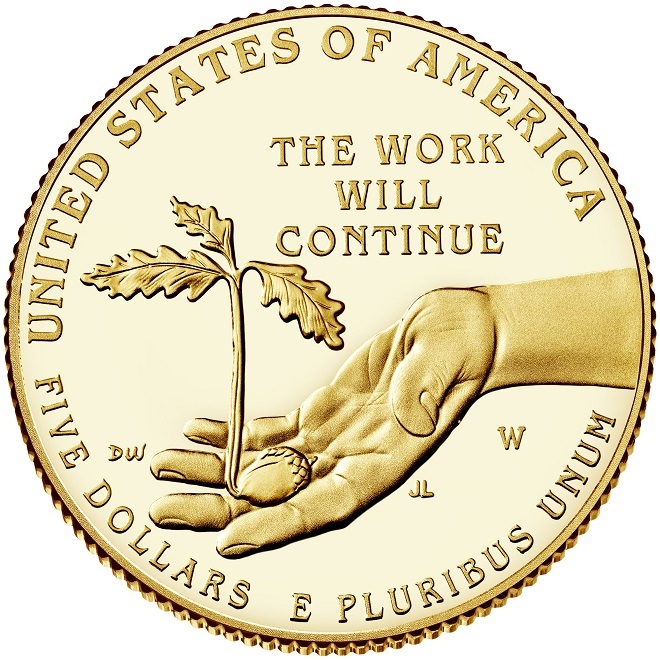 The gold reverse was also designed by Donna Weaver, sculpted by U.S. Mint sculptor-engraver Jim Licaretz, and features an outstretched hand holding a young oak tree growing from an acorn. As stated in the idiom “Mighty oaks from little acorns grow,” this design represents the potential of each child helped by Boys Town to grow into a productive, complete adult. Both the obverse and reverse of the silver dollar coin were designed by Mint Artistic Infusion program designer Emily Damstra and sculpted by U.S. Mint sculptor-engraver Joseph Menna. The front of the coin shows a young girl sitting alone and gazing upward into the branches of an oak tree looking for help. The empty space around the girl is deliberate and meant to illustrate the child’s sense of loneliness, isolation, and helplessness. The back of the coin features an oak tree offering shelter and a sense of belonging to the family holding hands below it, which includes the girl from the front. The clad half dollar obverse was designed by Artistic Infusion program designer Chris Costello, sculpted by U.S. Mint sculptor-engraver Renata Gordon, and features an older brother holding the hand of his younger brother in 1917. They walk toward Father Flanagan’s Boys Home and the 1940s Pylon representing what would become Boys Town. 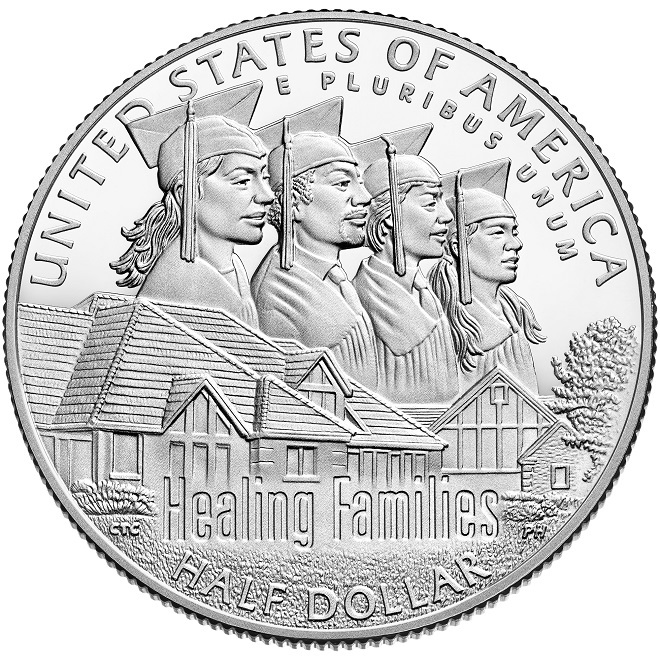 The clad half dollar reverse was also designed by Chris Costello, sculpted by U.S. Mint sculptor-engraver Phebe Hemphill, and features a present-day Boys Town neighborhood of homes where children are schooled and nurtured by caring families. Out of these homes come young adults who graduate from high school and the Boys Town program.